Home » Piano » How Many Keys Does a Piano Have? How Many Keys Does a Piano Have? But the classic 88-key piano is not your only choice when buying a keyboard. There are two other varieties, designed for improved portability and convenience when it comes to dealing with music styles that require the use of fewer octaves. The full-size 88-key model, which is designed to mimic a grand piano, and is perfect for learning to play the piano. Each of these options has its own pros and cons. Some would argue that a beginner needs no more than 61 keys, but even basic music books contain songs that would require at least the 76-key version. 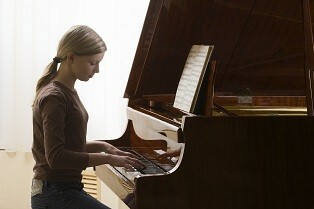 The latter is a more balanced option, but for the full advantages of a portable piano, you will need all 88 keys. What Are the Pros and Cons of a Full 88-key Piano Keyboard? A keyboard featuring all 88 keys has many advantages and only a few small drawbacks. Let’s take a look at the good news first: what makes these keyboards so special? You can use them to play any song in the world, even the most complicated ones. They faithfully imitate the sound and function of a grand piano, so once you learn to play them, you’ll know how to play the piano as well. No improvisations are ever required. You don’t have to pay a lot of money on upgrading from a smaller 61 or 76-key model, in case you need 88 keys after learning the basics. That being said, keyboards with the full set of 88 keys can be more expensive, larger (measuring about 5 feet in length) and heavier than smaller keyboards. Despite these few drawbacks, they still offer the best possible experience, both for a beginner and for a seasoned piano player.